Oh my gosh, were you punched in the face? Are you tired? Are you feeling okay? These are all questions I hear on a daily basis because of my ridiculously dark undereye dark circles. You'd think it would be against basic social etiquette to ask someone whether they've been punched in the face, but I digress. I've written multiple times before about how I'm constantly trying to cover up my dark circles, and how they're the plague of my existence. I never would have thought I'd put a picture out on the big bad Internet of one of my biggest insecurities, but I finally just decided to say screw it. This is the face I wake up with in the morning, and if I'm going to be posting pictures of myself on here I should probably have one of myself naturally, flaws and all. Anyways, back to the concealer. Recently I've kind of come to terms with the fact that my dark circles will never be 100% concealed, so I'd rather cover them up a little and look natural than try and cake on a full-coverage concealer and still have them peaking through. I took a before and after picture above, and as you can see my dark circles are definitely on the extreme side of things. Oddly enough, while my undereyes are definitely dark they also have some serious redness. 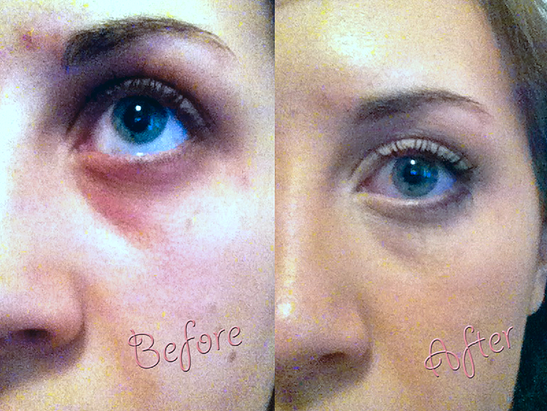 Because of this, while trying to bring some light to the area I also want to cancel out some of the redness. So first I start with an eye cream, which is a very important step. Recently I've been using the Origins Dr. Weil Mega which provides a great base and hydration to the delicate skin under eyes. It's supposed to also have some brightening qualities, which I really can't speak to, but I think it does the job of an eye cream well. Next up, I use It Cosmetics Bye Bye Redness, which has been a much-hyped makeup product in the blogosphere. While most people use it for a foundation base, I find that a light layer of it completely cancels out the redness around my eyes and create a more skin colored based to put concealer on top of. This product is highly pigmented, so for me it's really heavy to use all over my face. I will say though that anyone who suffers with rosacea or redness should really look into this product, because it is a miracle worker at completely cancelling out any and all redness. Finally, I use my Clarins Instant Concealer duo, which I wrote about in my post earlier. Shade 02 works to correct some darkness, while shade 01 brightens everything up. After this I do the rest of my eye makeup and voila! You can 100% still see some darkness peaking through but it's a far cry from what it looked like originally. I'll try and do more posts on other concealer options, but thought I'd start out with what I'm using in my routine right now.